General Description of Blood Group Antigen H Type 2. Recognizes the blood group H type 2 antigens, trisaccharide Fuc 1-2Gal 1-4GlcNAc 1 of human origin. This protein is the basis of the ABO blood group system. The histo-blood group ABO involves three carbohydrate antigens: A, B,, H. A, B,, AB individuals express a glycosyltransferase activity that converts the H antigen to the A antigen (by addition of UDP-GalNAc) or to the B antigen (by addition of UDP-Gal), whereas O individuals lack such activity. It is expressed on endothelial cells, epithelial cells, granulocytes. 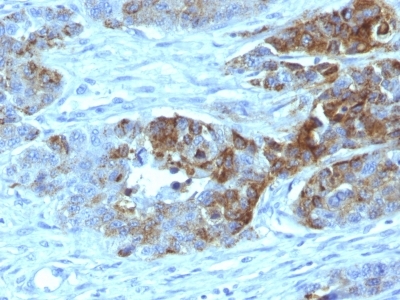 Increased expression of this antigen has been observed on some tumor tissues such as gastric carcinomas, urothelial carcinomas,, colon carcinomas. Anti-Human Blood Group Antigen H Type 2 Positive Control Sample: KG1 cells or human colorectal carcinoma. enQuire Bio's Blood Group Antigen H Type 2 Anti-Human Monoclonal is available for Research Use Only. This antibody is guaranteed to work for a period of two years when properly stored.